Data democratisation is not a reality yet. Not everyone can process or analyse the huge volumes of data which are collected in the digital revolution. Friction between what the market needs and what the workforce can supply has huge financial implication. According to the latest Qlik commissioned study, large enterprises ($10.7 billion enterprise value) which have higher corporate data literacy can have $320-$534 million in higher enterprise value. The study conducted between 27 June to 18 July 2018 collected responses from business decision makers of 600 selected global publicly traded companies across various industries. A total of 1008 interviews were conducted in the US, Europe and Asia. Companies were scored based on the extent to which they had the necessary data and the capabilities to use data for decision making. Results are captured in the Corporate Data Literacy Index. The survey was designed to measure three dimensions of corporate data literacy: (i) the data skills of the employees (human capital), (ii) data-driven decision making, and (iii) data skill dispersion. To be corporate data literate is to be able to read, analyse and utilise data for decision making. Secondly, the individual should be able to communicate with data and make data driven decisions within the organisation. 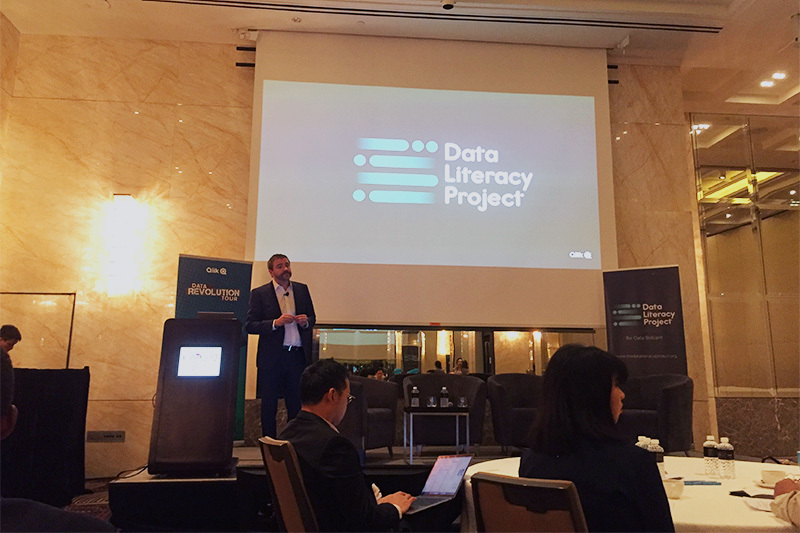 Mr James Fisher, Senior Vice President, Strategic Marketing for Qlik, said that data literacy is more important than the technology being released. It is no big secret that data can transform and add value to business. But without a culture of using and sharing data, corporates are already impeded early in the game. Corporate data literacy is important for stellar financial performance. There is a positive correlation between corporates with higher data literacy and other measures of corporate performance. These include gross margin, return-on-assets, return-on-equity and return-on-sales. What exactly are these eye-opening statistics? The first is a deep data literacy divide across geographies. Given the differing development levels, data literacy is not uniform. Europe ranks highest on the Data Literacy score. The UK, Germany and France are among the most mature nations for corporate Data Literacy. Contrarily, the US and APAC regions scored slightly lower. Singapore, however, proved to be an exception in this region. In fact, the Index shows Singapore is the most data literate nation globally. Singapore’s score was 84.1, higher than the UK (81.3) and Germany (79.0). Even so, 85% of workers in Singapore don’t feel confident in their ability to read, work, analyse and argue with data. 65% of Singaporeans admit that despite the need to work with more data compared to three years ago. Yet, only 15% of employees know how to deal with data. Furthermore, business decision makers in Singapore lag behind India in their data handling confidence. In this metric, Singapore scored 17% whereas India’s was 46% – the highest confidence level globally. Regional differences aside, gulfs were seen across the various industries surveyed. The median Corporate Data Literacy score was highest for Admin, Support, and Waste Management and Remed Services. Whereas, Health Care and Social Assistance lagged by 14 points. Even retail and real estate industries underperformed – sectors which could greatly benefit from data driven initiatives. Despite near universal consensus on the benefits of becoming a data literate company, there appears to be apathy among corporates. Firstly, data skills do not necessarily lead to more data-driven decision making. Even though 93% and 98% of all business leaders acknowledge that data is important to their industry and how the company makes decisions respectively, only 8% have made major changes in the way the data is used over the past five years. Oddly enough, only 29% of business decision makers in large enterprises believe data literacy is an important factor in a successful economy. The study also found that businesses are not ready to pay for widespread data expertise. Although 92% of business decision makers believe it is important for employees to be data literate, only 24% of the global workforce report they are fully confident in their ability to read, work with, analyse and communicate data. Surprisingly, while 63% of companies are planning to hire more data literate employees, business leaders are not keen on upskilling their workforce to become more data literate. Only 34% of firms currently provide data literacy training, and only 36% will pay higher salaries to data literate employees. A mere 17% of respondents report that their business significantly encourages employees to become more confident with data. To change the culture to becoming more data literate, Qlik has launched the Data Literacy Project. The Project brings together a global community dedicated to igniting rich discussions and provides tools to shape a confident and successful data literate society. Interested individuals can access free and paid educational online courses to upskill themselves. An online tool is also available for an organisation to assess themselves on where they are in their corporate data literacy journey, relative to other companies.